KTM Philippines made waves during the recently concluded 11th Inside RACING Bike Festival and Trade Show, the biggest gathering of motorcycle manufacturers and enthusiasts held at the World Trade Center. Making its presence felt in a huge way, KTM Southeast Asia Managing Director Julian Legazpi, Sales Director Gianluca Lozzi, and Adventure Cycle Philippines Inc. President and COO Dino Santos, showed off the exciting, high-powered line of KTM motorcycles—all “Ready to Race”—including the 200 Duke which comes available in the market at 147K pesos. 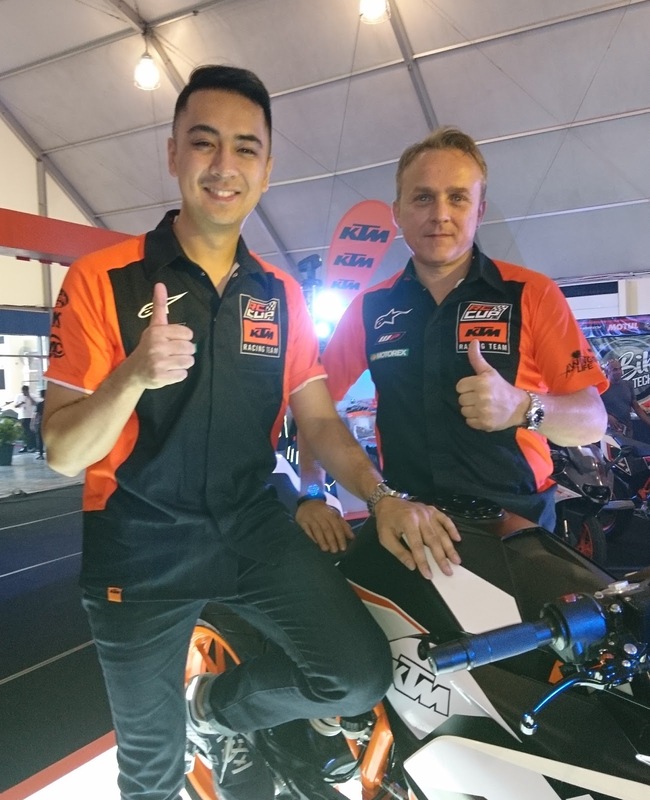 The event also saw the introduction of 18-year old racing wunderkind Ralph Kenneth Torres, the first sponsored rider to the prestigious KTM RC Cup Asia to be held at the challenging Sepang International Circuit in Malaysia this March to November 2017. Torres has over a decade’s experience on the track, bagging numerous trophies both locally and internationally, among them: the 2015 MOTO IR Champion; 2013 Golden Wheel Award Scooter Champion; 2012 IRGP Scooter Champion; 2010 115cc Underbone King Overall Champion; and the 160cc Scooter Class Overall Champion. Motorcycle aficionados and racing enthusiasts joined KTM in its excitement including Department of Tourism Assistant Secretary Ricky Alegre, Wheeltek Big Bikes Division General Manager Bobby Orbe, motorcycle legend Max Kienle and television and movie actor and KTM fan Paulo Avelino. KTM Philippines also took the opportunity to proudly announce the forthcoming opening of the KTM Asia Motorcycle Manufacturing Philippines, Inc. (KAMMI) plant in Laguna, a joint-venture partnership between Ayala Group and KTM AG of Austria, that will eventually export motorcycles to China. KTM motorcycles are available in existing and expanding KTM dealerships nationwide. For the full listing, visit www.ktm.ph. For details about the KTM RC Cup Asia, go to www.ktmrccup.com.